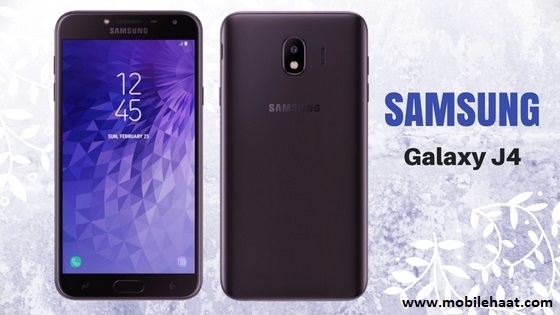 The Samsung Galaxy J4 is a balanced mid-range and low-end smartphone. This device has nothing very attractive. But it does provide some fine specifications. There is 4G network coverage to ensure fast internet browsing. The 3000 mAh battery provides up to 20 hours of 3G talk time, which is great. 13MP autofocus rear camera quality is superior. It also supports full HD video recording, which you can view in a full HD display. But we expect a better front camera than 5 megapixels. The 5.5-inch super AMOLED HD display is affordable. Then we got the latest (as of May 2018) Android Oreo v8.0 operating system. 2 GB RAM,16GB R0M, 1.4 GHz quad-core CPU, Exynos 7570 chipset and Mali T720 GPU ensure fast performance and smooth HD gaming possibilities. But it is more than just a top performance phone. Therefore, over-intensive multitasking or games can cause latency or performance issues. The Samsung Galaxy J4 has not OTG, fingerprint or gorilla glass protection. The display is also not a stylish full view display. Network Scope: 2G, 3G, 4G. Operating System: Android Oreo v8.0. Graphics Processing Unite (GPU): Mali-T720 MP2. Body: 151.7 x 77.2 x 8.1 millimeter. Weight: 175 grams (plastic body). SIM Card Type: Dual SIM (Micro-SIM, dual stand-by). Display Resolution: HD 720 x 1280 pixels. Display Protection: Super AMOLED Touchscreen. Colors Available: Black, Gold, Orchid Gray. Camera Factors (Back): Autofocus, LED flash, f/1.9 aperture, auto face detection, HDR, panorama mode. Camera Resolution (Front): 5 Megapixel (LED flash, f/2.2 aperture). Memory Card Slot: MicroSD, up to 256 GB (dedicated slot). Battery Type & Performance: Lithium-ion 3000 mAh (removable) Stand-by time: - Talk-time: up to 20 hours (3G). MP3, MP4,Radio, RDS, GPRS, Edge, HTML.